Abbey View i Galway, Irland: Bestill nå! 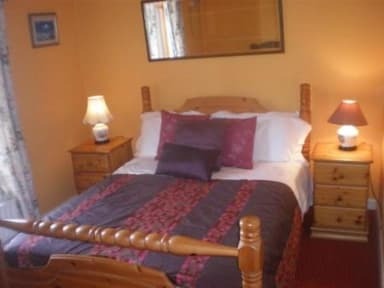 Abbey View is a comfortable, family-run B&B, conveniently located just 5mins outside Galway City. Surrounded by tranquil countryside it is an ideal base from which to explore the Galway and Connemara. We offer 4 bright and spacious guest rooms, all equipped with en-suite bathrooms, televisions, wireless internet access, hairdryers and tea/coffee-making facilities. Each room enjoys views of the surrounding countryside. A peaceful nights sleep is assured. Other amenities included cosy guest lounge with open fire, landscaped gardens and private parking. A hearty breakfast is served up each morning in our breakfast room, starting with continental items such as juice, freshly baked bread, cereals and yoghurt, and moving on to a choice of cooked breakfasts, from Scrambled eggs, Pancakes with maple syrup to the traditional Irish breakfast. A warm welcome awaits you at Abbey View where your host Bernie who will do her utmost to help guests with information. 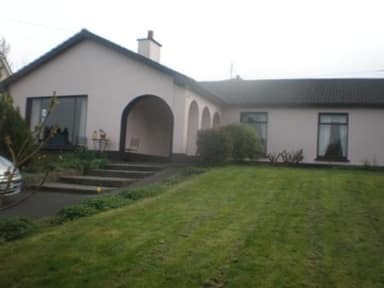 Abbey View is a warm and friendly family home located just a 5-minute drive from Galway city. All the attractions of Galway and Connemara, including the lovely mountains and lakes of Connemara and the Cong and Maam Valley, the Aran Islands, Kylemore Abbey and the National Park are easily reached by car. Abbey View is a great place to come home to after a busy day angling, walking, cycling, golfing, mountaineering or whatever else takes your fancy.